A perfect side dish or appetizer, these little bite-sized gems will explode with flavor in your mouth, leaving your palate wanting more. 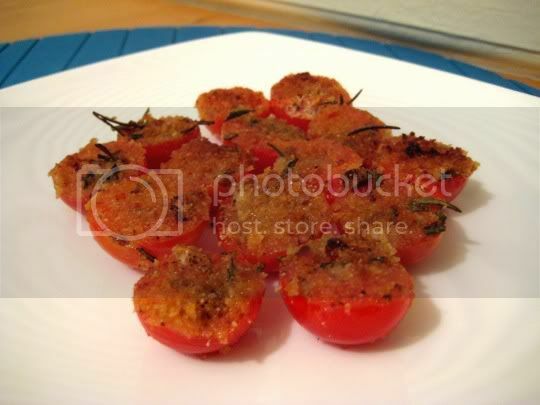 Extremely simple to make, cherry tomatoes are halved, placed cut side up in a baking dish, sprinkled with an herb mixture and bread crumbs, and baked then broiled. The herb mixture consists of salt, pepper, minced garlic, and chopped fresh rosemary. Rosemary, garlic, and tomatoes are always an amazing flavor combination, and the bread crumbs on top add a wonderful crunch and savoriness. The amount of bread crumbs may seem extreme, but it works out well in the end. Olive oil is also drizzled on top before baking, and this combined with the bread crumbs leaves a nice crust topping after the tomatoes are broiled. And the riper the tomatoes, the juicier and sweeter they will be, so make sure to use them as ripe as possible. Everything about this dish is amazing: the crunchy crispy garlic topping, the juicy sweetness of the tomatoes, and the fresh woodsiness of the rosemary. There is no question that you will enjoy! Make again? Definitely. I could pop these like bonbons all day long!